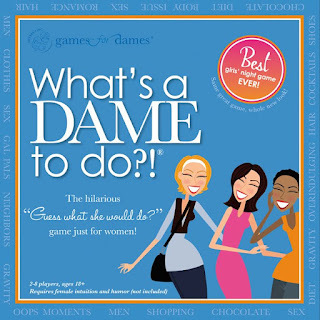 Girls Night In Playing: @GamesForDames What's A Dame To Do?! I think by now you all know how much I love spending time with my girlfriends. Once or twice a month we get together for drinks and some times we go out for some dancing fun, but then there are times, like this Winter, when it's too cold to even think about going out. So instead we make a night of fun by staying in. 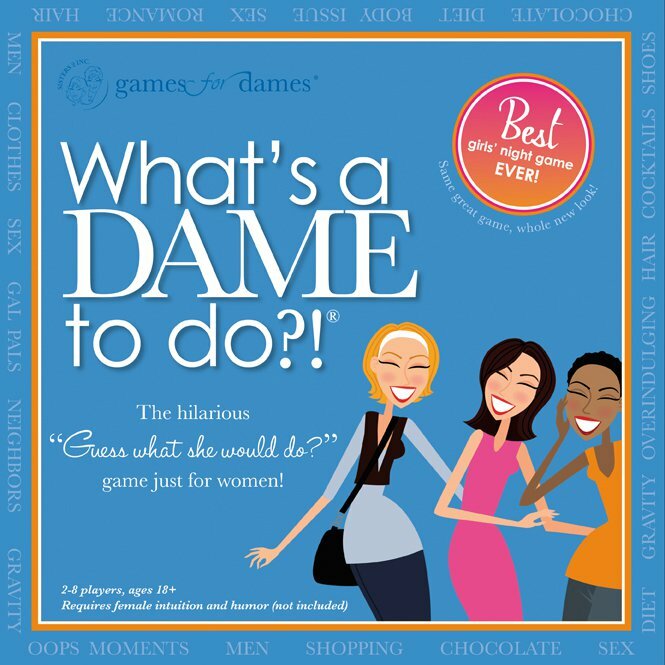 When I was contacted to review What's A Dame To Do, I checked out their website to see what the game was about and quickly responded with a yes. This is a perfect game for a night in with the girls. What's A Dame To Do is a board-game for two to eight ladies to play. The object of this game is to guess what you think your girlfriend would do in a certain situation. So for example, if a card turned up for a player saying: "You find a hideous shirt your spouse bought and asked them, "Oh is this for your mom?" Your spouse replies, "No, it's for you!" The other players then have to guess what your reaction would be. It totally is. Playing this game with your girlfriends, especially the ones that you know like the back of your hand is so much fun. We had such a great time playing this game. I'd recommend this for any group of ladies who are looking for a great night of fun. You won't be disappointed. You'll laugh til you cry playing this game, that's for sure. It's perfect for Bachelorette Parties, Bridal Showers, Baby Showers, girls nights in and so much more. What's A Dame To Do is valued at around $24.99 and you can check them out on their website, Facebook and Twitter. Disclosure: All opinions are my own. I received What's A Dame To Do?! at no cost for the purpose of this review. No other compensation was received. you're an expert on this subject. Fine with your permission let me to grab your feed to keep updated with forthcoming post. Thanks a million and please keep up the enjoyable work.